We know how much we need to reduce emissions to stop global disaster. The plan doesn’t come close to getting us there. “There’s such a thing as being too late.” So said President Obama as he unveiled the new Clean Power Plan, which aims to fight climate change–and theoretically help prevent catastrophic impact–by cutting emissions from power plants. By 2030, by speeding up the closure of coal power plants, the plan would trim electricity pollution by a third. It’s a step in the right direction, especially for air pollution in the communities that have to live next to power plants. But is it enough to help avoid 2°C of global warming, the point at which things start looking more apocalyptic? Last year, the UN’s Intergovernmental Panel on Climate Change said that in order to stay within the two-degree limit and avoid disaster, we’d have to cut emissions 41%-72% by 2050. While Obama has also proposed some other new climate standards through the EPA, like tighter fuel-economy standards and cutting methane emissions from oil and gas wells, none of it adds up to what the IPCC says is necessary. At Stanford, Jacobson has researched what it would take for every state to move to 100% renewable energy–not just electricity, but transportation and heating and cooling. It’s technically and financially feasible, he found, for every state to get 80%-85% renewable energy by 2030. By 2050, there’s no reason we couldn’t run on 100% renewable energy. Jacobson and fellow researchers laid out a detailed roadmap showing how every state could run on wind, solar, and hydropower–no oil, coal, or natural gas. (The researchers also eliminated nuclear power, carbon capture, biofuels, which they say cause other problems). The modeling showed that we’d end up with more jobs, better health, and a reliable electric grid. Some states are already partway there. California and New York have each pledged to reduce around 50% of climate emissions by 2030. Hawaii plans to cut emissions in the electricity sector by 100% by 2045. “We really need 80% reductions in all sectors by 2030,” Jacobson says. He also argues that Obama shouldn’t have included carbon capture as part of his plan–since carbon capture itself requires 25% more energy, and results in more pollution from other chemicals. “This technique would make it the ‘Dirty Power Plan’ rather than the Clean Power Plan,” he says. It’s not the technologies, it’s the politics that are the barrier. It’s not even clear that the new plan would dramatically change the slow drop in coal power generation that is already happening. 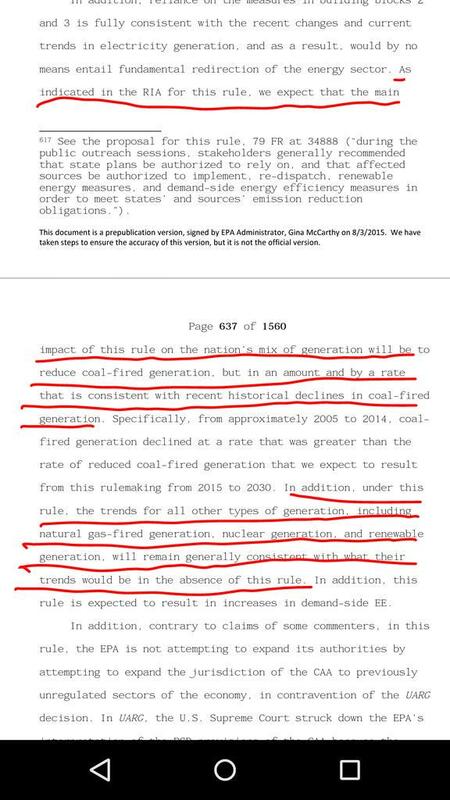 In fact, as the plan stands, an EPA report found that it would reduce coal power plant generation at at a slightly slower rate than it has already been happening anyway over the last few years. Can the shift to clean energy happen without strong federal leadership? “It is happening, state by state,” says Sarah Shanley Hope, executive director of the Solutions Project, a nonprofit that is using the Stanford research to push states to move to 100% renewables. The organization has a map of the country showing how renewables are quickly growing everywhere from Iowa to Texas. But a carbon tax, which can only come from the federal government, would go a long way toward helping as well.